The warning against the worsened natural environment has been strongly claimed since 1960's in Japan. The Japanese economy developed at a great pace, and the natural environment got worse at the same time. However, it has been improved gradually since 1970’s because of the government and a lot of companies’ consistent efforts. 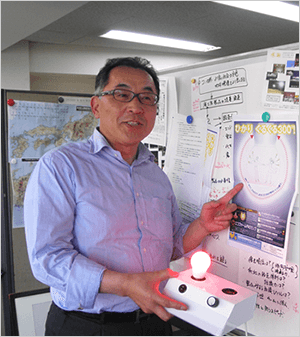 The Japanese technology for the environmental protection developed phenomenally in the last 40 years, and today, Japan is one of the best environmentally conscious countries. We, Eco Junction, have been working on the issue with the firm sense of mission “Mottainai”, and since 2006, we decided to specialize in the business related to ecology. We declare that we will sustain our efforts to achieve the coexistence with the Earth by making the most of our outstanding knowledge, experience and technology. Click this PDF file for details. Due to the increase of the worldwide population and the unstable weather caused by the global warming, the issue of the food shortage is one of the controversial topics all over the world today. In Japan, especially, low rate of the Japanese food self-sufficiency is one of the serious problems. Today, since the horrible natural disaster tsunami caused by the huge earthquake on March 11th in 2011, a lot of farmers have been suffering from its influence, such as the sharp increase of the electricity costs and the restriction of the use of electricity. We suggest you install our LED products to produce your farm products steadily. We tested our LED products over and over again for providing the best LED light bulbs for raising mushrooms, chickens, flowers, vegetables and fruits. If you cultivate farm products indoors and replace your incandescent light bulbs and fluorescent lights by our LED light bulbs, you will be able to save your electricity costs dramatically. Moreover, it is also possible that you can produce without paying the electricity costs if you install both the LED light bulbs and a solar power generation system. Click this PDF files for details of plans of installing the solar power generation system (Under amendment. Please wait for a while.). We can provide custom-made products for your needs as well, so please feel free to contact us if you have any questions or comments. Click this link for detail information of Eco Farm Pro Lamp. 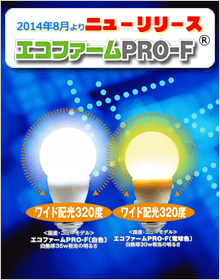 Eco Farm Pro Lamp is a professional LED light bulb for chicken raising which we jointly developed with chicken farmers. It has an illumination angle of approximately 360 degrees like incandescent light bulb. The result of the tests of its performance for chicken raising was highly rated by farmers in both rearing periods and egg-laying periods. 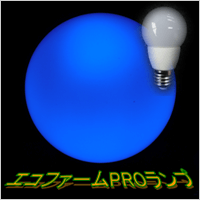 Eco Farm Pro Lamp provides white, blue, red, amber and the standard light bulb color. Above all, amber makes chickens relaxed and stable emotionally. Patent pending (The patent application No.2011-122744). We developed Eco Farm Pro Lamp especially for chicken raising, and exhaustively pursued its safety. It has a built-in overcurrent protection IC, therefore, you do not have to worry about ignition even if lightning strikes. Compared to incandescent light bulb, LED light bulb hardly gives infrared rays and ultraviolet rays which bugs like. Therefore, the amount of the bugs around the light bulbs will decrease, and your coops will be more hygienic. The stable indoor crop production which is not influenced by weather conditions has attracted attention for over 20 years. The main crops are vegetables, flowers, fruits, mushrooms, chickens and their eggs which are sold at relatively high prices. Water, fertilizer, soil, and light are necessary for indoor productions. In terms of light, incandescent light bulbs and fluorescent lights have been used until today. LED products had been expensive until around 2005, therefore, it would take 10 to 15 years to pay them off by saving electricity costs with them. This is why LED products were not really popular, however now, agricultural colleges and expert organizations test them in practical ways, and collect a lot of data and good results. We have delivered 30,000 LED light bars in Japan so far!! LED light bar for mushroom cultivation.